ABS observed the World Autism Awareness Day at Royal Banquet Hall on 2nd of April. This year’s theme focuses on the importance of empowering women and girls with autism and involving them and their representative organizations in policy and decision making to address these challenges. The Honorable chief guest Mr. Gerald Daly, UN Resident Coordinator/ UNDP Resident Representative mentioned, “Ability Bhutan Society is a most practical example of Gross National Happiness” and “How we should enhance our work on achieving gender equality and empowering our women and girls.” He also said that it’s a chance for us to work on our efforts to achieve the Sustainable Development Goals which upholds the 2030 Agenda’s core promise to leave no one behind. 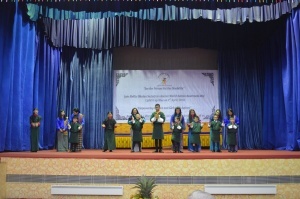 The programme also included message from chairperson of ABS, cultural program by Changangkha Middle Secondary School and Draktsho Vocational Training Center for special children and youth. A child with autism, Master Siddarth, delivered a heart melting speech where he mentioned that, people with autism struggle with social skills in a way that might make them seem unfriendly. People with autism feel the same emotions anyone else does and that they communicate those feelings in different ways. Autism is a spectrum, with early intervention; it is possible for children to test out of the spectrum later on in life. He ended his speech by saying, “1 in 68 children is diagnosed on the autism spectrum. 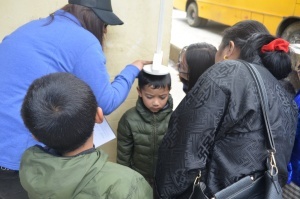 That means that on World Autism Awareness Day it is more important to understand and accept autism than ever before.” Later Draktsho Vocational Training Centre for Special Children and Youth had held a general health check up camp on the World Autism Awareness Day for children and families of ABS and Draktsho. ABS also joined the world in Light it up Blue campaign, by lighting up a prominent landmark in the city with its golden spires and bells, The National Memorial Chorten, Thimphu till 3rd April 8, 2018 to raise awareness of autism. The initiative is generally associated with Autism Speaks. Autism Speaks is an autism advocacy organization in the United States that sponsors autism research and conducts awareness and outreach activities aimed at families, governments, and the public.